The overhead canoe and kayak storage idea you've been looking for. Ideal for your garage, apartment, shop or other urban location. 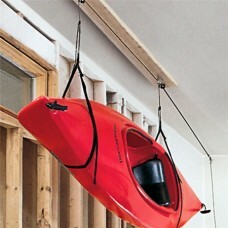 Using the Harken Hoister system, your kayak is suspended securely from the ceiling. Superior to racks, hooks, wall mounts, wall hangers or other storage organization options because your kayak hangs in often unused ceiling space. 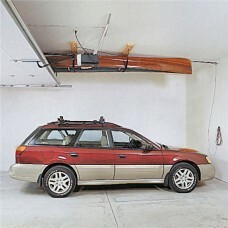 Mount it above your garage parking space and store your boat directly from your car or truck. 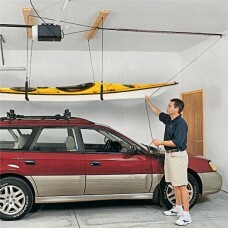 Harken kayak hanger lifts are designed to be operated easily by one person. Raises and lowers even heavy ocean kayaks with a single rope using an innovative pulley design which keeps the load steady and even regardless of weight distribution. Self-locking safety kicks in instantly if the rope is accidentally released. Stainless steel hardware, double-braid rope for strength, durability and long life. When it comes to creative kayak storage accessories, this is as good as it gets! Works for all kinds of boats (canoes, kayaks, ocean kayaks, sea kayaks, inflatables, etc.). Can also be used to efficiently store other household accessories. Everything is included for quick and easy mounting and installation. Please see our online videos section for examples of how to use a Harken Lifter for kayak garage storage. And feel free to contact our online support if you have any questions about storing your boat. Review the product options below carefully, the 2 point lift systems should work for most kayaks, however sea kayaks, ocean kayaks, and large canoes will need a 4 point lift.